Celebrating its 35th anniversary in 2018, there is little to suggest that Marina Maher’s firm is resting on its not inconsiderable laurels, which include serial recognition as an Agency of the Year in recent years, culminating in this year's win as overall Agency of the Year in North America. While the firm’s growth has always struck an impressive note among its publicly-held peers, 20% topline expansion in consecutive years to around $62m in 2018 suggests that MMC is now playing in a rarefied group of firms that do not just reflect the zeitgeist, but define it. Neither has the agency’s remarkable performance been slowed by a broad reorganisation that has taken place over the past 18 months; instead, it seems safer to say that the restructuring — which includes the deployment of an integrated model that houses critical mass in creative and strategy, design and content, digital innovation, and data/analytics — is underpinning MMC’s turbo-charged progress. While the evolved structure has meant plenty of change, the senior leadership team remains settled. The firm continues to be led by founder and CEO Marina Maher, supported by chief integration officer Diana Littman, executive director Nancy Lowman LaBadie, ECD Ted Sabarese, chief strategy officer Joydeep Dey and David Richeson, chief of digital innovation and influence. Also of note, more than 75% of MMC’s revenue now comes from a mix of disciplines and 58% of its people hail from diversified marketing backgrounds, reflected in an approach that ensures brand management only ever accounts for 50% of a specific account team, supplemented by executives from its specialist units. From a single office in New York (albeit bolstered these days through partnerships with Omnicom global sister agencies), MMC manages efforts for global giants such as P&G, Johnson & Johnson, Celgene, Eisai, Galderma, Bayer and Merck. 2017, meanwhile, saw MMC return a remarkable new business performance, thanks to an 80% win rate that helped secure major assignments from Aflac, J&J, Glenmark, Nature’s Path, Dr Scholl’s, Coppertone and Novartis. AKA Asia has been on an upward trajectory since it was founded by former Grayling directors Kate O’Shea and Amy Wright in 2008, but 2017 was a particularly good year for the firm. Total revenue grew by 46% to $4.2m (SGD), and the agency doubled its margin in 12 months. AKA Asia also secured more retainers in the first quarter of 2017 than any other year on record, and added 10 to its headcount, bringing its staff to 31. The growth reflects the transformation of the firm from a creative PR shop to an award-winning integrated comms consultancy, as comfortable competing with digital and advertising agencies as with its traditional rivals in the PR space. Growth has been driven by an increased focus on design and production, along with broad capabilities across corporate, consumer and digital. Over the past 12 months, there was new business from Deliveroo, Manulife, Discovery Networks APAC, BreadTalk, Giant, AsiaMalls, OPPO, and ScienceFest 2018, joining existing clients such as Jetstar, Bugaboo, EDB Precision Engineering, Costa Coffee and Treasury Wine Estates. Culture is everything at Mischief, which was set up in 2006 to “play with the norm”. The 70-strong consumer agency has maintained its entrepreneurial and, yes, mischievous spirit over the past decade and is now deservedly known not only for its creative work, but its focus on “work-life blend”. This ranges from sabbaticals, experience days and training everyone in coaching, to encouraging “side hustles” and supporting everyone’s interests and responsibilities out of work, whether they are parents or training for a marathon. CEO Frankie Cory took over seamlessly from founder Mitch Kaye in 2013, and the strong culture she has nurtured (with a measure of justified pride) has been a crucial factor in the agency’s development and retention of talent: 90% of Mischief’s account directors joined on its graduate scheme or as assistant account executives, and account director and creative Andy Garner and strategist Daniella Graham represented the UK in Cannes this summer as winners of the national Young Lions competition. It’s also all about the clients, of course, and Mischief developed some impressively effective campaigns last year, including revitalising social media engagement for the Football Association, increasing consumer affinity with the National Trust, and getting the UK talking about mental health for the Government’s Time To Talk Day. In fact, 2017 was the agency’s most award-winning year yet, including two gold AMEC awards for measurement, a deeper emphasis on which has been driven by planning director Gemma Moroney. Existing clients including Asda, Unilever, AkzoNobel, BAE Systems, Vodafone and Sport England were joined by a raft of other big brands over the year, and the agency maintained fee income of £5.2m. Much of Olson Engage’s most remarkable work comes from its two longest-standing and largest clients: MillersCoors and Mars Wrigley Confectionery; meanwhile it continues to expand the number of brands it represents for Kraft Heinz. Other clients include PepsiCo, Belize Tourism Board, BEHR Paint, Beam Suntory, Reynolds Consumer Products, along with new wins like Target, Papa Johns, Days Inn, Uncle Ben’s and Oprah Winfrey’s O. And as we’re recognizing the agency as a fierce consumer PR engine, the firm is also growing into new areas with large-scale employee engagement assignments for UHG and Centene and an award-winning public affairs work for Elevate Minnesota. 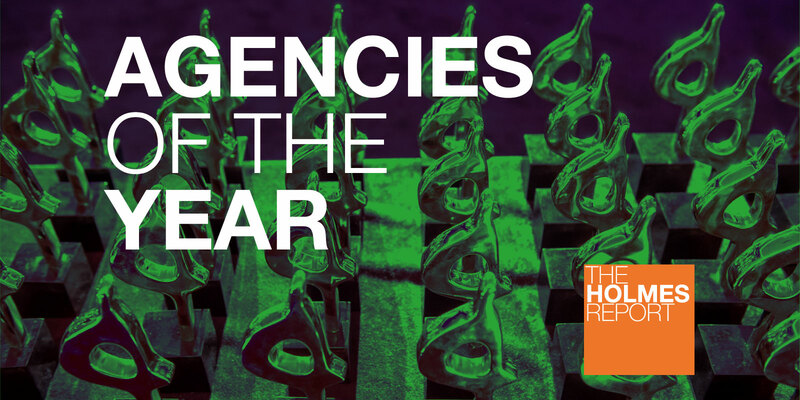 Considering Olson Engage’s remarkable creative track record, it’s worth noting that 2017 was the firm’s best-ever creative year in its 14-year history: six Gold SABRE nominations, eight Innovation SABRE wins from 23 nominations, three Cannes Lion wins, three One Show wins and two Shorty award wins, among others. In just eight years, W has established itself as one of the fastest-growing, most agile and most creative agencies in the business. Under the leadership of founder and global CEO Warren Johnson, the 101-strong agency has gained a reputation for award-winning work and a truly entrepreneurial spirit: W’s commercial shrewdness is arguably streets ahead of many of its rivals. Fee income across the company was up 23% from £5.83m to £7.19m. In March 2017 W acquired Glue in Newcastle, creating W North to join its offices in London, Amsterdam and Singapore. Johnson also significantly boosted his management team with strategy and creative smarts, hiring Adam Mack as CEO from Weber Shandwick, and Mark Perkins from MHP as creative director. The agency’s work ranges from serious social impact campaigns (dominating the news on World Mental Health Day for the charity CALM) to talent management (creating its first cinema ad for Lynx with Anthony Joshua). Over the year, new accounts for Spotify, Yo!, Hard Rock Hotel, Major League Baseball, Cancer Research UK and Money Supermarket joined other iconic brands on W’s client roster, including Levi’s (for whom it created the House of Levi’s in Soho, successfully reconnecting the heritage brand with hot music stars, actors and other influencers). The agency also built on its work for Lynx, Marmite and Ben & Jerry’s to grow its work for Unilever, scooping its entire food portfolio, and launched a festival division to run all comms for events including V and Wireless. And, as much investor and innovator as comms leader, W initiated a couple of further side ventures of its own in 2017, including working with the Chase vodka distillery to develop the UK’s first limoncello, Pococello (further underlining its drinks expertise, with a portfolio including Freixenet and Aperol), to taking a stake in jewellery specialist Facets and investing in the Allbright support network for female leaders. The company also has a Personal Development Fund to help its people gain sector expertise, and an Enterprise Seed Fund, allowing the team to invest in new businesses they are excited about.